The crowd at the 1960 Evansville All-City Teen Sock Hop was likely bigger than the population of The Jiants’ hometown of Marion, Indiana. “It got so out of hand that we had to have police protection,” keys player Lee Balsbaugh recalled. The quartet were riding their hit regional single “Tornado,” a loud, fast, out of control rockin’ bopper downing power lines at radio stations all over the Hoosier state. 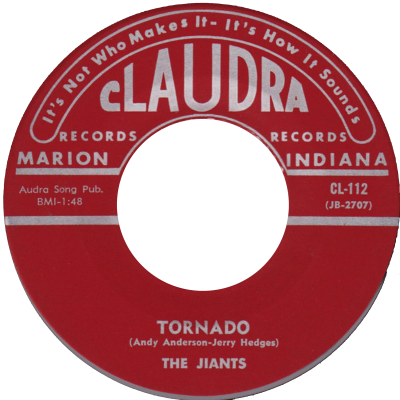 At the urging of the elder Hedges, the decidedly non-RnR Claud Nash took a flyer on “Tornado” for his country-friendly Claudra label, a portmanteau of Claud and his wife Audra’s names. The late 1959 session took place in Nash’s Marion studio, where the group ground through fifteen takes to get it right. “My fingers were actually bloody after too many takes with that glissando at the end,” Balsbaugh said. Vocalist Andy Anderson tore through the tale of a woman with swinging hips who twisted veins, with drummer Ron Wolfe behind him at breakneck speed. The whole thing lasted just a minute and 52 seconds. 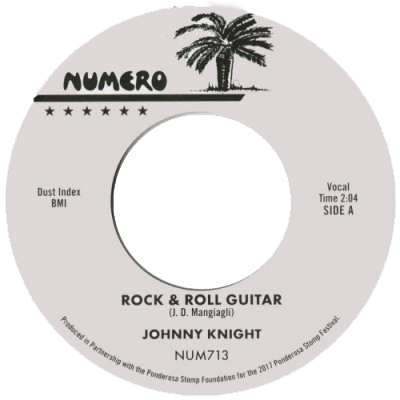 Balsbaugh estimates that the initial January 1, 1960 release was about 5,000 units, all with Claudra’s earnest “It’s not who makes it—It’s how it sounds” motto draped across the label.